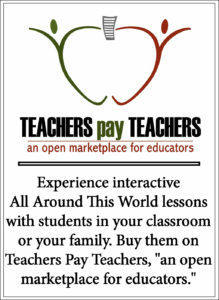 All Around This World’s classroom and homeschool lessons about West Asia and the Middle East for kids introduce your family to so many cultures through interactive fun . . .
West Asian and Middle Eastern music can be fast and furious, twisting and twirling rhythmically like a whirling dervish, or it can be gripping and even deeply passionate as it accompanies emotive folk dances or provides the musical framework that underpins the recitation of poetry. There is not one unified “West Asian” or “Middle Eastern” music, but rather a constellation of different musics from the region that overlap in structure, tone and rhythm, from ancient Persian Sufi music and Arabic classical music, to more modern styles like the Turkish, Arab-influenced “Arabesque” and Egypt’s “generational” music, al-jeel. 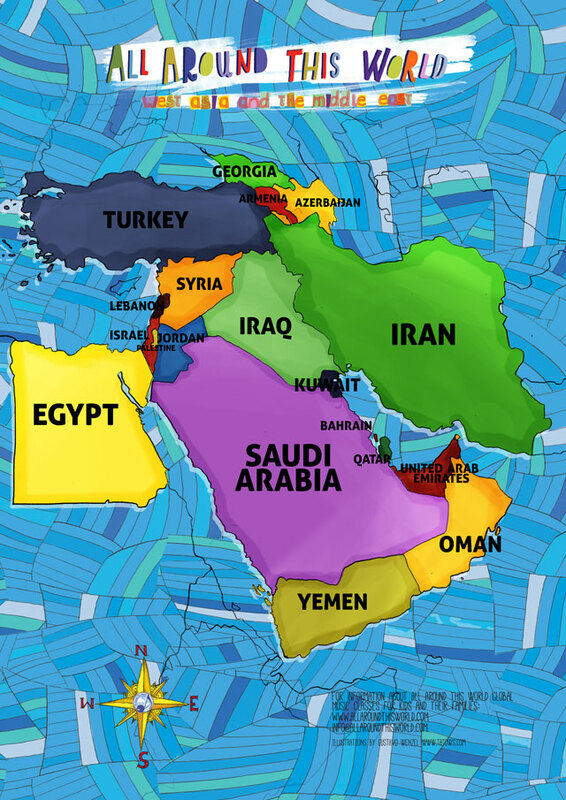 For the purpose of our overview we’re going to consider “West Asia and the Middle East” to be the area that stretches from Turkey in the West to Iran in the East. Iran is often rightly considered party of Central Asia, though we’re including it here because geopolitics connect it to the Middle East. We’re also going to include drums and rhythms that are Egypt, which is located in North Africa, as well as Georgia/Azerbaijan and Armenia, which may or may not be part of Asia (see a debate about whether these countries are in Asia or Europe). — Turkey: we keep the hot side hot and the cool side cool as we simulate a Turkish bath. — The Southern Caucasus: we dine around a long wooden table, sing polyrhymically and toast to life at a Georgian supra. — Iran: we celebrate Nowruz by leaping over fire and throwing our cares and misfortunes off the roof. — Iraq: we swing our long black hair scandalously by doing the hachaa. — Syria: we get married by hoisting our kids on our shoulders and doing the dabke. — Israelis and Palestinians: we end our tour of the region by joining the Israelis and Palestinians as we all dance and dance and dance in circles.